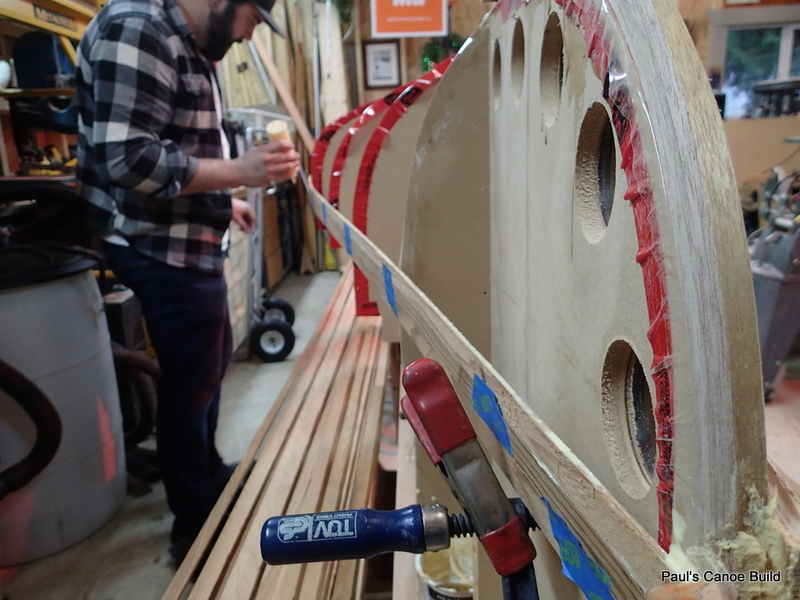 It is a Rainy day today, so Paul and I decide to put a few more strips on the canoe. 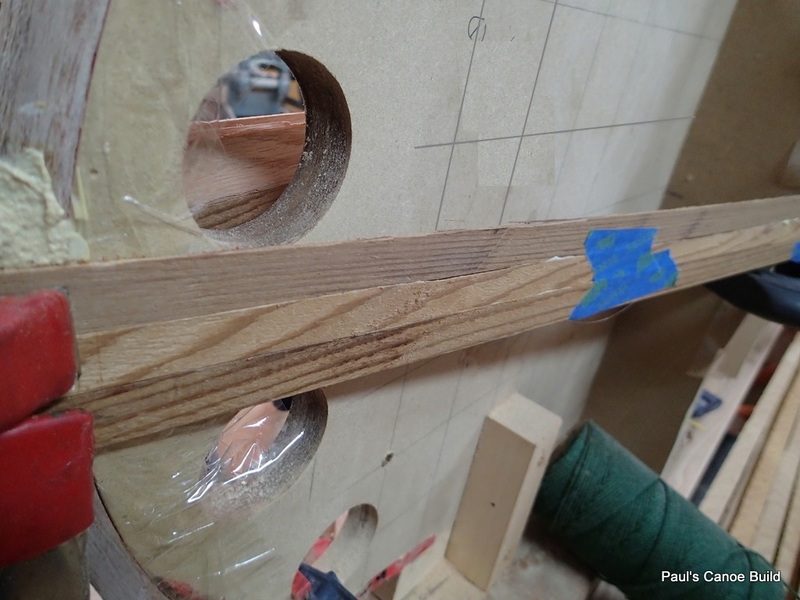 Three dark strips and the accent strip on the West side of the canoe from last time. 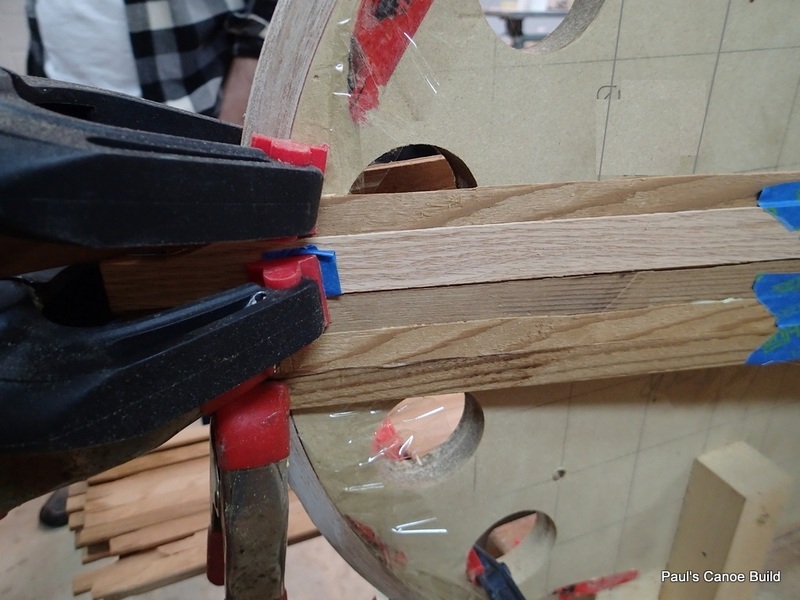 We take off all of the clamps and the blue painter’s tape and the strips are glued to each other. The blue tape worked!! Time to cut off some of the excess strip(s). We trip the strips on both ends of the canoe. There is a lot to think about putting on the first strip on the other side…much humming and hawing, measuring and trying it out. 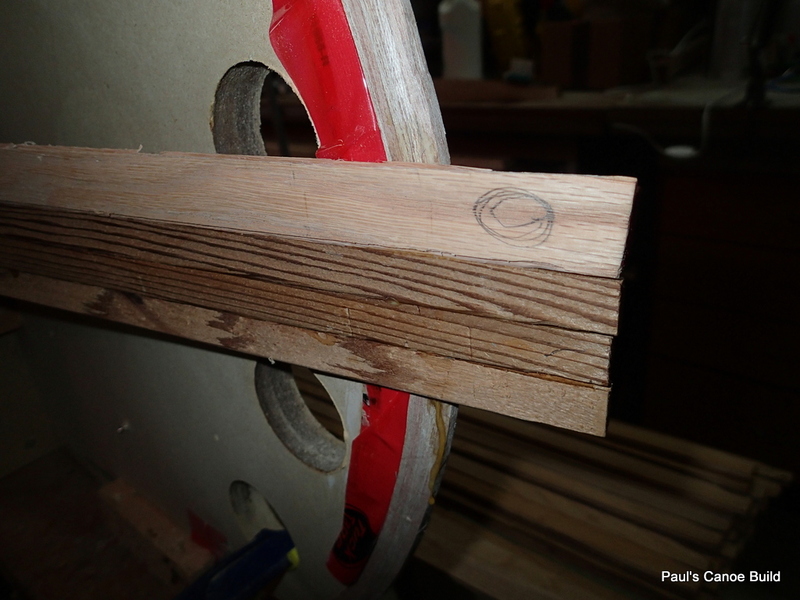 The bevel on the stemposts is not quite right and we mix some sawdust with the Tight Bond and glue on the first strip. 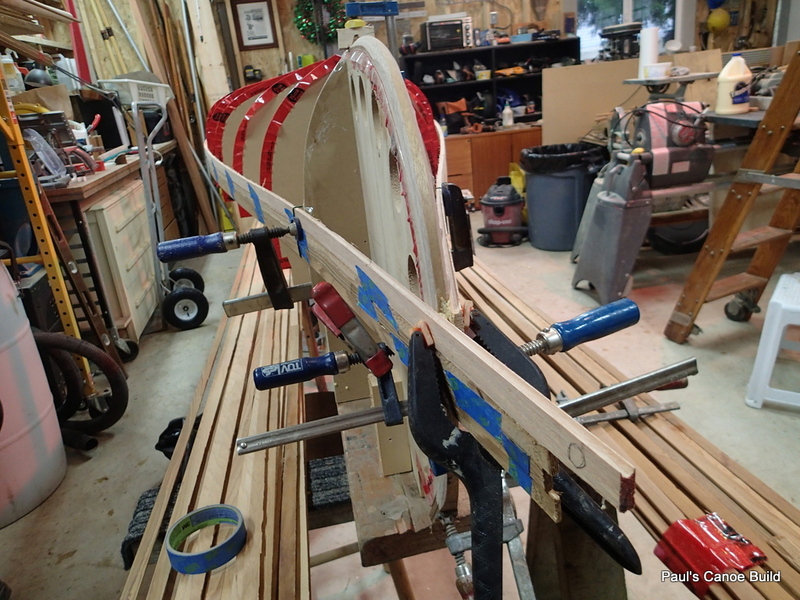 Glueing on the first strip onto the East side of the canoe. 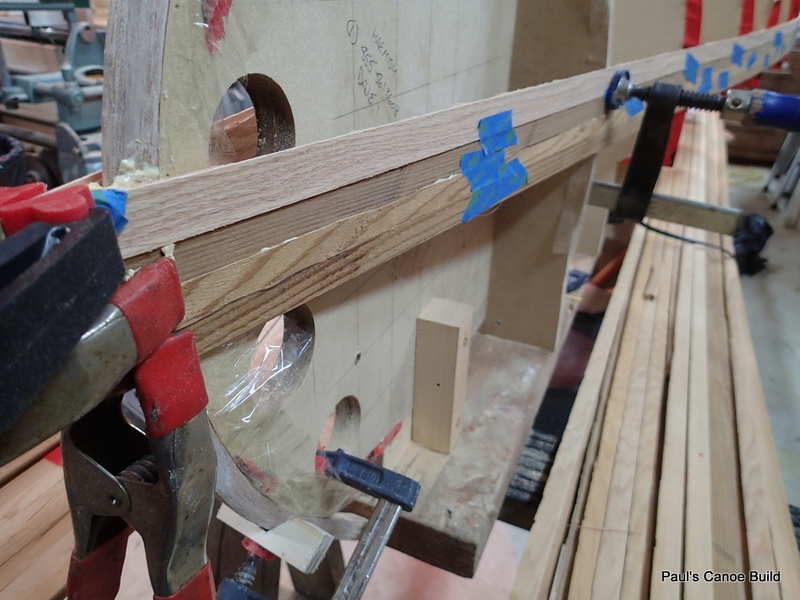 After we put the first strip on, we begin to glue up the next two. 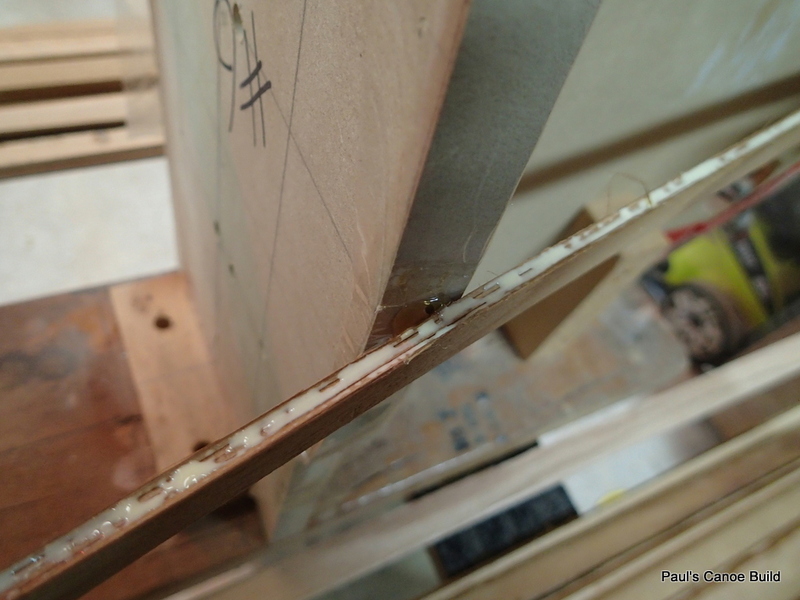 First strip hot-melt glued to the station form. Tight Bond II in the cove for the next strip. We see that one of the station forms is a little shy of the natural bend of the strip. We do not force the strip to the form. Natural curve of the strip does not reach the form. 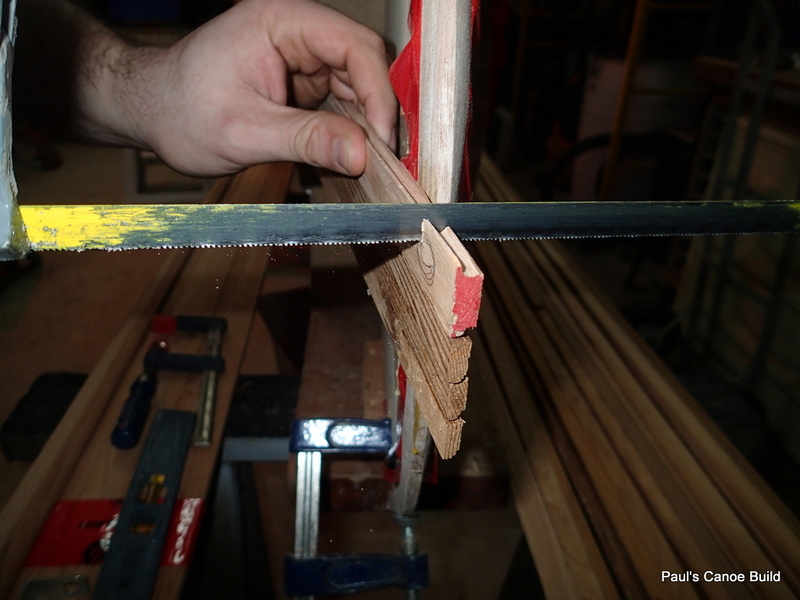 We glue up the three dark strips. Three dark strips on, time for the oak accent strip. Paul puts glue in the “cove”. Again, we are using blue painters tape to hold the strips together while the glue dries. 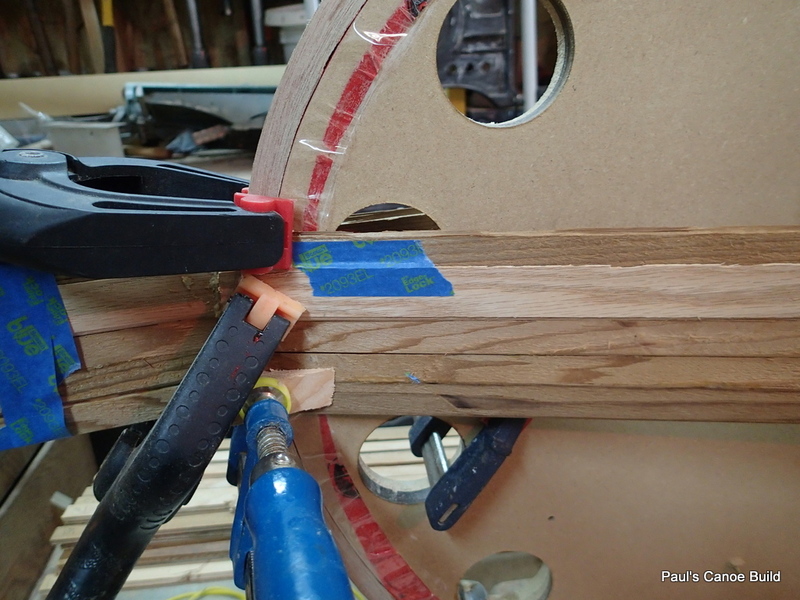 Spring clamps hold the strip to the stempost. 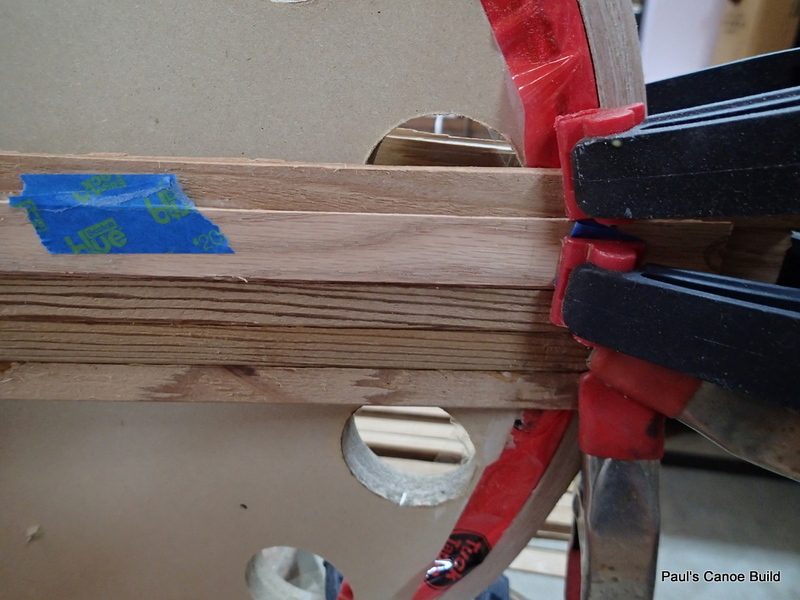 A bit of painter’s tape provides enough friction so the clamp does not slip. 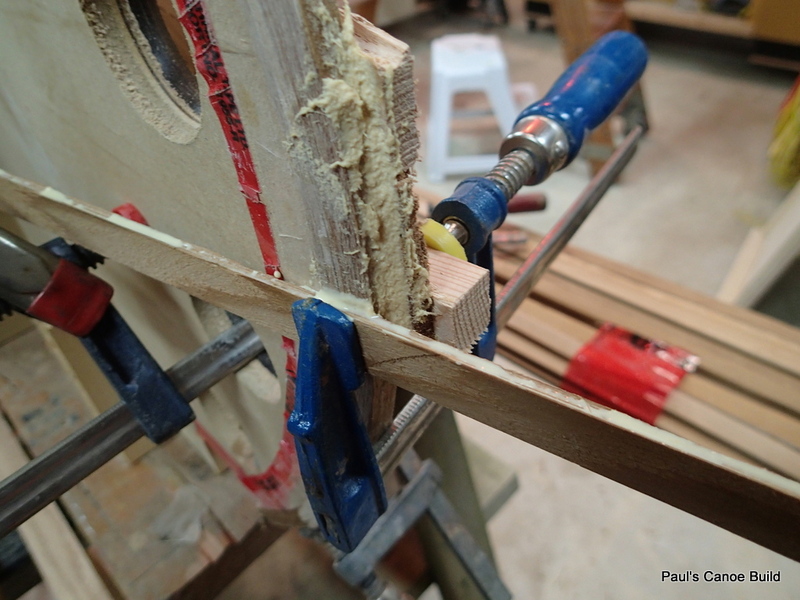 Good thing that I have a lot of clamps. End-on view. Looking very symmetrical! <—-East side of the shop Time for one more strip on each side. West side of the shop—->. 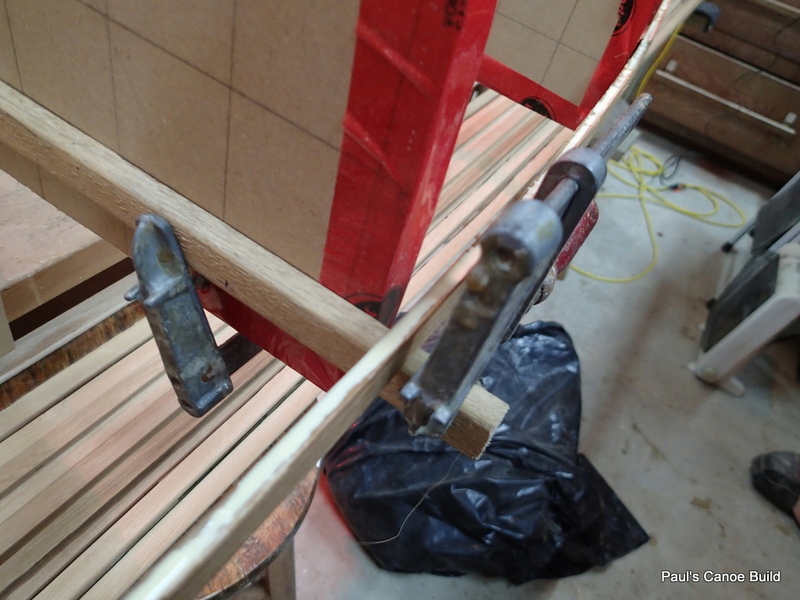 Strip on the West side of the canoe! 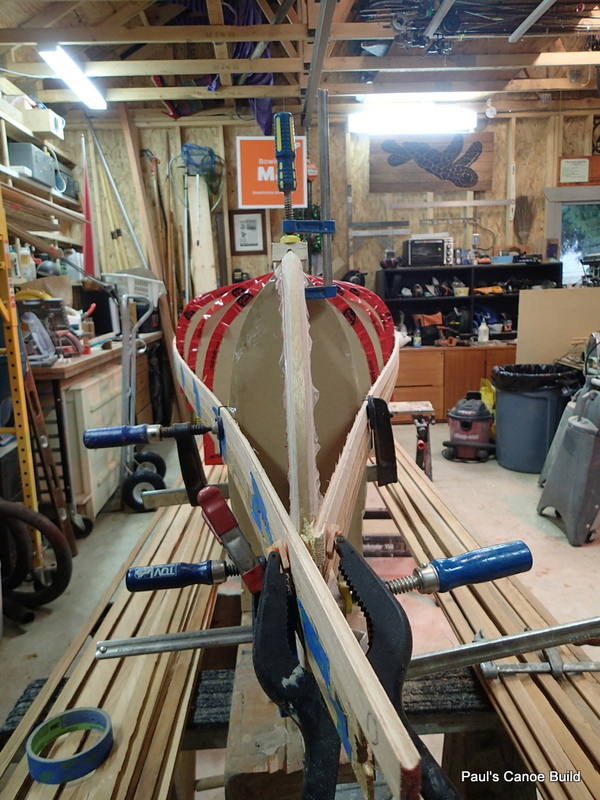 Both ends of the West side of the canoe clamped. 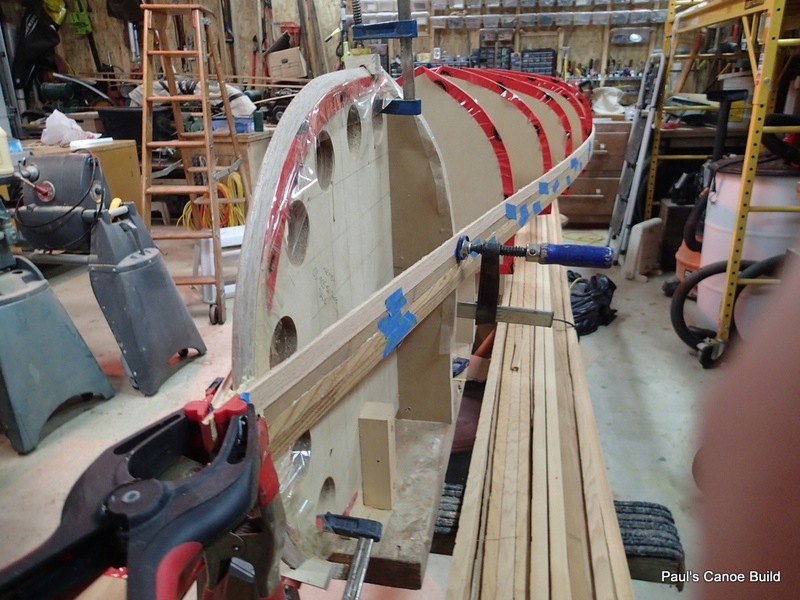 Forth strip on the East side of the canoe. We decide that Five strips are enough for today. We will try to put on a couple of strips every night this week and may be done by next weekend. Good paddling to you, Well, I will still be rowing.